Yes, these are old data...yup, it's survey data too. 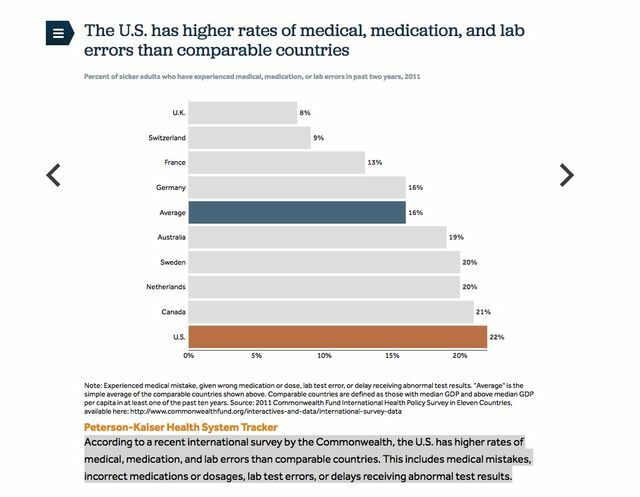 But, wow, can the error rate in US healthcare really be so high? Even if the rates indicated by The Commonwealth Fund in the graph beneath aren't current, could they even be in the ballpark? Unfortunately, the answer is yes. Typical service industries, like healthcare, operate at a level of 1-1.5 sigma; that is, there's one defect per every thousand opportunities. Yup, not good. So remember, service industries typically operate at that level of one defect per every thousand opportunities which is a much higher level than what you might guess working in the field each day. So, that said, shouldn't we intentionally work together to bring the rate down? Reimbursement, etc., aside...isn't it just the right thing to do?